At its meeting in Paris on 10 December 2014, the Committee on Legal Affairs and Human Rights of the Parliamentary Assembly of the Council of Europe held a briefing with civil society representatives about human rights challenges facing Europe at this time. Brigitte Dufour, Director of International Partnership for Human Rights (IPHR), spoke at this briefing on behalf of the Civic Solidarity Platform, a network of over 60 human rights NGOs in Europe, the former Soviet Union and North America of which IPHR is a member. Read her speech below or download it in PDF. I thank you for the opportunity to participate in this hearing. I’m speaking on behalf of the Civic Solidarity Platform (CSP), a network of over 60 human rights NGOs from Europe, North America and the former Soviet Union that my organisation International Partnership for Human Rights is a member of. I would like to focus on a number of pressing human rights issues that are of particular concern to the CSP and that we believe should feature as matters of priority in the Committee’s Work Programme. These and related issues were discussed at a civil society conference organized by the CSP in Basel last week and reflected in an outcome document adopted by the Conference participants. While the issues I want to highlight are already being addressed by this Committee in various ways (including in reports under preparation), we believe that they warrant strengthened and reinforced attention due to their serious and aggravated nature. Particularly worrying are measures to restrict access to foreign funding of NGOs and branding of groups who receive such funding as “fifth columns” and the like. In the past year, the situation has deteriorated to an unparalleled level in Azerbaijan and Russia. In Azerbaijan, NGOs have had their offices raided, bank accounts frozen, and leaders interrogated, banned from travelling, arrested and imprisoned as part of a coordinated campaign. It is especially troubling that our colleagues have been targeted in relation to their engagement with the Council of Europe. Rasul Jafarov, Leyla Yunus, Intigam Aliyev and Khadija Ismailova are now all in custody on trumped-up charges. 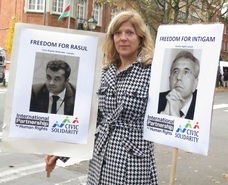 When arrested Rasul and Leyla were leading a civil society initiative to develop a list of political prisoners applying PACE criteria; Intigam has helped file over 100 cases with the European Court of Human Rights; and Khadija spoke at this autumn’s PACE session (and was banned from travelling abroad when returning). Another colleague, Gulnara Akhundova, who lives in Denmark, learned that her 67-year old mother was summoned by police and had her home searched after she testified at the October meeting of this Committee. In Russia, so far 16 leading NGOs have been registered as “foreign agents” against their will and several NGOs have been forced to close down to avoid further prosecution, while others are contemplating self-liquidation. I have observed the trials, in Moscow, of a number of the NGOs appealing prosecutor orders to adopt this discrediting label, and can ensure you that the decisions rejecting these appeals were not based on evidence supporting the accusations. Moreover, following June amendments to the controversial 2012 law, several groups have been registered as “foreign agents”, although court appeals in their cases are still under way. In Armenia, plans have been discussed to step up control over NGOs and their access to funding. Even in democratic member states such as Hungary and Bulgaria, NGOs receiving foreign funding have been accused of being “traitors” by media and public officials and subjected to pressure. We welcome the efforts of your Committee so far to address issues of growing pressure on civil society, such as by organizing hearings, initiating reports and issuing a statement on Azerbaijan in September. However, we encourage you to further prioritize these issues and to address them prominently, including by speaking up on behalf of individuals who are being punished for their efforts to promote Council of Europe values. The second issue that I wish to raise is related to the first one: namely that of political prisoners. The adoption of the October 2012 PACE resolution on criteria for political prisoners was a most welcome step. While CSP members were greatly disappointed that the draft resolution on political prisoners in Azerbaijan was voted down at the beginning of 2013, we believe that it is crucial that renewed and reinforced efforts are made to systematically apply these criteria to reported cases of political imprisonment of civil society representatives, journalists, political opponents and others in member states such as Armenia, Azerbaijan, Russia and Turkey. It is crucial that this is done in close consultation and cooperation with civil society. The CSP and its members are happy to cooperate. Third, the problem of torture and disappearances continues to plague the region. We find it particularly worrying that many of the judgments issued by the European Court of Human Rights (ECtHR) on torture in the past decade have not been adequately executed. The Norwegian Helsinki Committee (a CSP member) has pointed out that the Russian government has not delivered in practice on pledges to strengthen measures to implement ECtHR judgments. As a result, most judgments relating to torture and disappearances in the North Caucasus remain unimplemented, other than with respect to the provision of compensation. For example, a DNA database of missing persons has yet to be established, and no exhumation of anonymous graves has taken place. The pattern of torture and ill-treatment and disappearances that has been reported in connection with the conflict in Ukraine in recent months is likewise of serious concern. Such practices have also been used to target journalists covering the conflict, as well as human rights defenders monitoring developments and assisting victims. Fourth, the CSP is alarmed about attacks on Council of Europe founding values. Public officials in some member states question universal human rights principles in the name of protecting so-called “traditional” values, and the ECtHR is accused of issuing rulings that are “politicized” and undermine “national interests.” As pointed out by the Polish Helsinki Foundation for Human Rights, politicians in old democracies such as the United Kingdom set a dangerous example for political leaders in non-democratic member states by vehemently criticizing the ECtHR. Moreover, we are concerned about actions of individual representatives of the Council of Europe that jeopardize the organisation’s role as a guardian of human rights and democracy. I’m thinking in particular of the serious damage to the organisation’s credibility caused by Azerbaijan’s recent Committee of Ministers Chairmanship, in the course of which it further stepped up its civil society crackdown. The CSP also regrets, among others, that PACE and European Parliament observers took a position on the Azerbaijani presidential election last year that contrasted with assessments of OSCE and local observers, thereby enabling the government to dismiss the criticism of the latter. We believe that your Committee should consider these challenges and how to respond to them with a view to safeguarding the role and image of the Council of Europe and the PACE as value-bearers. Thank you and Happy Human Rights Day!